I’ve long campaigned for West End theatres to be properly refitted, not just patched up along the way. I’ve also kept wondering aloud just where the restoration charges, collected now by every theatre on every ticket sold, actually go at most of them, since the audience hardly seem to be seeing or benefiting from what they’re actually paying for. We would be satisfying a need that isn’t satisfied in the West End as things stand. But there are very few people who would do what Cameron Mackintosh is proposing to do. He’s made a lot of money and is putting it back in. This is not remotely a commercial proposition. If you’re a commercial theatre operator, your dream ticket is Phantom of the Opera where you sit back and take the rent. Actually, there’s been a sea change in the way commercial theatres operate over the last decade. Commercial producers of plays are no longer offered open-ended runs but are confined to strictly limited runs, typically of 13 weeks. High turnover seems to be the mantra nowadays. So the new Ambassadors/Sondheim scheme is following a trend. There’s also been an increasing appetite for creating more flexible spaces in the West End. 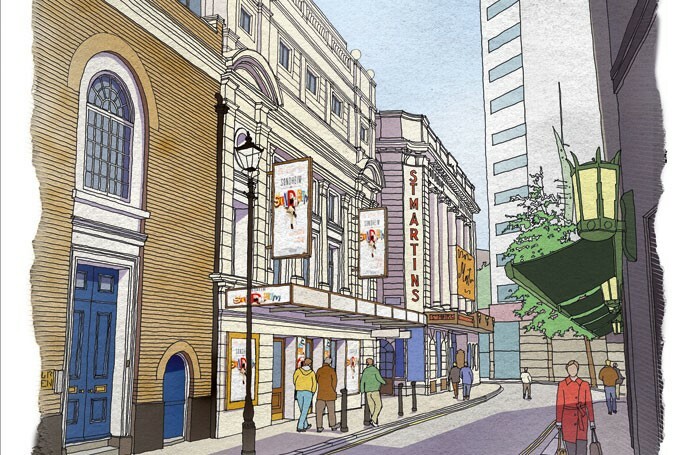 The transformation of the Whitehall Theatre into the Trafalgar Studios a few years ago was an attempt to do so – though in my opinion it’s a bodged effort that’s created probably the most uncomfortable pair of venues in town. On one of my visits to the main house a few months ago when Jamie Lloyd directed James McAvoy there in The Ruling Class, I had to rebuff two assaults being made to claim my tolerable aisle seat in exchange for an intolerable one further down the row. Both people had leg problems that made them want to sit at the end of a row, but I, too, suffer from a bad back and hip, so I held out. (My aisle seat wasn’t, after all, the only aisle seat to be asked for – it just happened to be the first one they saw as they came into the auditorium). Meanwhile, the claustrophobic downstairs studio is even worse, with dreadful uncomfortable bench seating squashing people into the available space. No doubt the Sondheim Theatre, if and when it goes ahead, will mean that it becomes the first port of call for shows to want to go to, just as Mackintosh’s other West End theatres are among the most sought after in town for producers to book, too. Audience comfort means something. Let’s hope that it ups the game of other theatre operators.